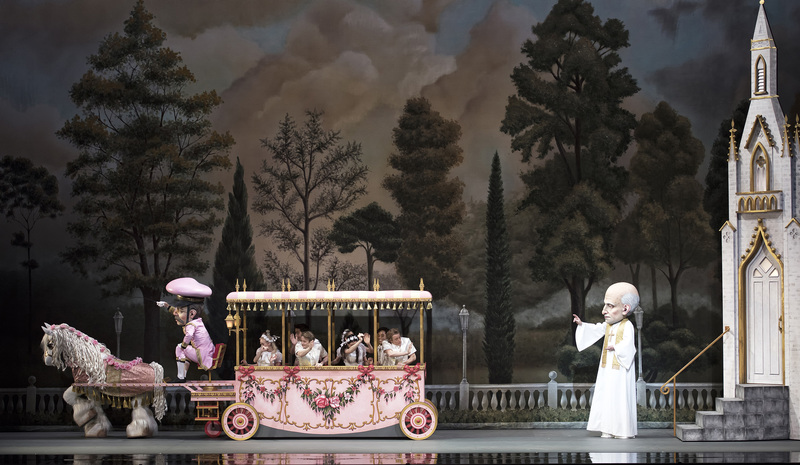 No one in their right mind thinks the ballet stage needs any more dancing sweets, yet there was something irresistible about the announcement that American Ballet Theatre Artist-in-Residence Alexei Ratmansky planned to resurrect Richard Strauss’ 1924 two-act ballet “Schlagobers” (Whipped Cream) with sets and costumes by the inimitable Mark Ryden. If done right, the hipster surrealist painter’s bubblegum-pink creative womb — fertilized with antique splendors, magical creatures, and unhealthy, blue-grey isolates — would surely undercut any cloying in Strauss’ sweet-themed fantasia. Deep breath. 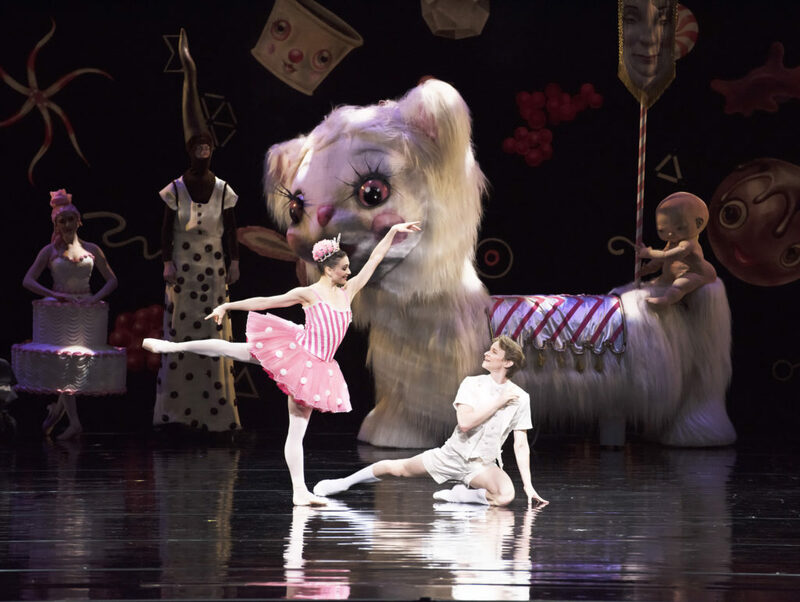 At the world premiere of “Whipped Cream” at Costa Mesa’s Segerstrom Center, the celebration and execution of Ryden’s vision could not have gone better. And the crowds were awesome: more fascinators and patterned suits than I’ve ever seen. I felt naked without a hat. If I were an artistic director at any ballet company in the world right now, I’d be sticking pins in my eyeballs that I hadn’t used Ryden for any one of many recent “Nutcracker” or “Sleeping Beauty” remakes. The co-mingling of intricately costumed characters with life-sized versions of Ryden’s poised, red-eyed aberrative beings — swelled-headed authorities, furry yaks and pigs, a candy-striped human worm — produces a strangely seductive, unbidden society that utterly consumes the house. Yes, it’s just theater. But as the sight of one of Ryden’s great Abe Lincoln heads on the set drop reminds us: It might be the last thing you ever see. And I’ll take this vision, yes please. That principal dancer David Hallberg returned to the U.S. stage (after a multi-year injury) with the company added more excitement to an euphoric evening, and requires a photograph. Hallberg played Prince Coffee, a guy who thinks he’s all that but is dressed like a bellhop (coffee really is about service, especially heavy lifting). The Prince has got lots of ideas about Princess Tea Leaves (Stella Abrera) but half the time he’s not there to follow through on a lift and his coffee guards catch her instead. Their real connection is less grand, more surreptitious — there’s one great moment when she flies towards him and sticks to his torso almost magnetically. 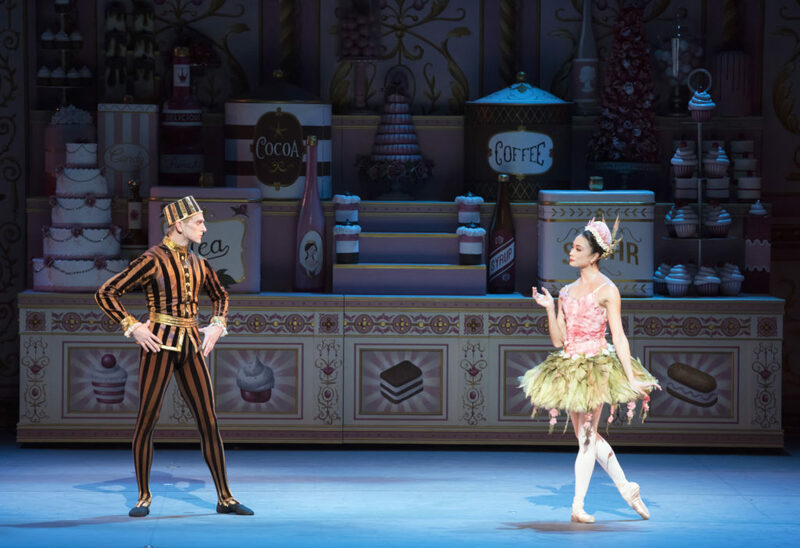 Ratmansky’s sugar-fueled relationships and movement phrases are inherently human and funny: sometimes devilish in speed, other times moody and hilarious. On first take, I was less enchanted by Act II’s evolution inside the hospital. That what was found to be lurking amidst Ryden’s brilliant hospital environs — a dark, disembodied bed in a celestial sky, mixing mystery and eternity with cruel austerity and a giant watchful eyeball — is a doctor hitting the bottle just seemed too simple and long-drawn. But there are so many details stuffed into this production there is no way to see it all in one viewing. The nurses and liquor and boy were all spinning patterns too. So I reserve final opinion until I see the production again and again. For now, let me close with a huge shout-out to Danil Simkin as the boy. His portrait throughout, particularly his bravado jumps and turns at the ballet’s climax, made it feel possible that his enthusiasm for “Schlagobers” generated this whole sweet alt-beauty kaleidoscope of pain and pleasure. Though I enjoyed both Stella Abrera and Sarah Lane in the lead female roles, I really wish the men had received the full bouquets at this world premiere. It would have been fitting in a million ways. There are 6 more performances; I’d go for any cast, any seat you can get. Tickets here. Isn’t there something in Ryden’s creatures that makes them quietly imploring? Like they’re stuffed with impossible history that they cannot begin to explain? Thus to have them dancing — wordlessly seeking expression — feels so organic and right.